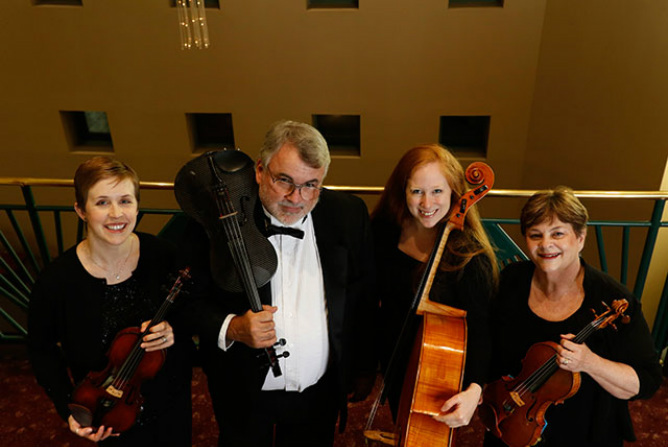 The Signature Quartet at Tulsa Community College was established in 2001 as an education and performance quartet. The quartet performs more than 100 concerts a year in front of audiences of all ages. It performs works from Ludwig Van Beethoven to Michael Jackson. The quartet members also teach and coach more than 1,000 students each year. The quartet shares the emotional and personal benefits of music as well as impact youth in Tulsa and the surrounding area with Signature Symphony’s Higher Scale. Higher Scale operates as a partnership between Signature Symphony, Tulsa Public Schools and Tulsa Community College to take music education and experiences into elementary schools where music programs otherwise would not exist. Hosting a workshop for 50 string teachers in Oklahoma with Robert Gillespie, a master string instructor. Coaching and conducting at TulsaFest, a festival in the summer for beginning to expert string students. Offering concerts for patients at Cancer Treatment Centers of America in Tulsa. Erica D. Parker, cellist, has been working professionally with Signature Quartet and Signature Symphony since 2001. She is an advocate for music education in Tulsa Public Schools specializing in at-risk areas and continuing to coach and teach students in the Tulsa area. She has a Bachelor of Music from the University of Oklahoma and a Master’s in Music from the University of North Carolina Greensboro. Erica has premiered many new compositions at the southeast composers conference. She has performed with Rod Stewart, Casting Crowns, Van Cliburn and many other talented artists. She is a professor at Tulsa Community College and Oral Roberts University. She coaches cello students at TulsaFest in the summers and recently added a workshop for adult cello students at Oral Roberts University. Recently, she did a national and regional premiere of 10 brand new compositions with Portico Dance Theatre. Jeffrey A. Smith holds four degrees in music: a Master of Music (Viola) from the Cleveland Institute of Music; a Master of Music Education from the University of Tulsa; a Bachelor of Music Education from the University of Tulsa (With Honor); and a Bachelor of Music (Viola, With Distinction) from the University of Kansas. Jeff is one of only a few Digidesign (now AVID) Certified HD -7 Pro Tools Operators (Audio Engineering) in the state of Oklahoma, and is a member of the National Academy of Recording Arts and Sciences. He has taught all instruments (strings, winds, and percussion) at all grade levels since 1979, served as contest judge, clinician, and as the 1992 All-O.M.E.A. (All-State) Orchestra Chairman. He is a founding member of the Tulsa Little Symphony and is currently the Principal Violist of the Signature Symphony at TCC. He was a member of the Tulsa Philharmonic and Wichita Symphony Orchestras. He is Past President of the Oklahoma Chapter of the American String Teacher’s Association, and in the summer of 1996, served as the Principal Violist of the Twenty-Fifth International String Orchestra in Graz, Austria. He has taught middle school strings at TulsaFest since its inception. He is an adjunct faculty member for Tulsa Community College, and is President of SongSmith Records, a digital recording facility and record company. He has composed several works for full orchestra and many arrangements for string quartet. Jeff played “fiddle,” guitar, keyboards, and ran the monitor mix and the light show for Dale Christenson and Prairie Fire for 10 years. He also played with the Ray Marshall Band. He has performed with several national touring productions including Camelot, Peter Pan, and Sunset Boulevard. In the fall of 2002, Tulsa Public Schools honored Jeff with an award for excellence. In 2003, the Oklahoma Chapter of the American String Teacher’s Association named him “Teacher of the Year.” In 2007, after 27 years of service, he retired from public school life to concentrate on development of young artists through SongSmith Records. He currently teaches violin, viola, and studio recording techniques at TCC. Jeff and his wife, Robin, adopted their son, Edik, from Russia in 2010. He is a member of the Signature Symphony Advisory Board, and proudly rides his motorcycle as a Ride Captain with the Oklahoma Patriot Guard Riders. Esther Fellows, performer and teacher of violin, viola, and piano, is a member of Signature Quartet, section First Violinist with the Signature Symphony (Tulsa, OK), Assistant Concertmaster of the Bartlesville Symphony Orchestra (Bartlesville, OK), Principal Viola with the Arkansas Philharmonic (Bentonville, AR), as well as section violist in the Tulsa Symphony Orchestra, (Tulsa, OK). Esther received her BM Ed from the University of Colorado, where her teachers included Abraham Chavez and Oswald Lehnert (violin), and Guy Duckworth and Storm Bull (piano). Highlights from her extensive musical credentials include being currently the only official Suzuki Association sanctioned Suzuki Teacher Trainer in Oklahoma, as well as registered Suzuki training in 10 books, Sonata Seminar, SPA, Practicum, and Every Child Can, by the Suzuki Association of the Americas (SAA), nationally Permanent Professional Certified Teacher of Music by Music Teachers National Association on violin, viola, and piano (certification through recital, lesson videotapes, examination, and Pedagogy Notebook), advanced violin training at the Starling-Delay Symposium, at The Juilliard School, Parliamentarian and Past-President of Tulsa Accredited Music Teachers Association, as well as past Chair of Scholarship Auditions, past Recording Secretary and past Chair of the Sonatina Competition for TAMTA. She is a member of Suzuki Association of the Americas, Hyechka Club of Tulsa, Tulsa Accredited Music Teachers Association, Oklahoma Music Teachers Association, Music Teachers National Association, American String Teachers Association, American Viola Society and the American Federation of Musicians. She is published in American Music Teacher and by the American String Teachers Association. Esther is also listed in Marquis’ Who’s Who of American Women, Who’s Who of American Education, Who’s Who in America, and Who’s Who in the World. Rachel Hay, a native Oklahoman, joined Signature Quartet in 2010 and serves as second violinist. She holds a bachelor’s degree in violin performance from the University of Iowa and a master’s degree in performance from the University of New Mexico. During her collegiate summers, Rachel attended such music festivals as the Tafelmusik Baroque Summer Institute in Toronto, Indiana University’s “Retreat for Professional Violinists,” and the Upper-Midwest Chamber Music Conference in Mankato, Minn. While at New Mexico, Rachel also participated in an intensive two-year Suzuki Pedagogy program that emphasized teaching at all levels with developmentally appropriate methods. Rachel has taught orchestra in public and private schools from grades 3-12 and was the Suzuki Area Head at the New Mexico School of Music for four years. Following her interest in early childhood development, she also became a licensed Music Together instructor in 2014.